First of three pumpkins this year. 8D My grandpa wanted a pumpkin to decorate his house for the trick-or-treaters, so I carved something traditional Halloweeny: a werewolf. So much badass! What'd your gramps say when he saw it? I would've whistled and been like, "DAAAMMMN!" You did this with an ordinary knofe!? EPIC! This is soooo made of win! How do you get the shading effect? 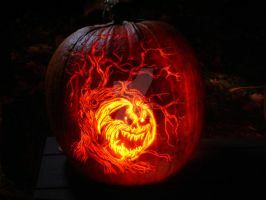 It's the pumpkin flesh, and the deeper you carve, the brighter the glow, so I shaded it with a clay loop tool. By carving it deeper at certain places, more light will shine through and make those parts brighter - while the thicker parts are darker. He only cut through at the teeth and eye. It's amazing. Sorry for answering in his place, but artists usually don't have time to reply to comments, or are too stuck up to answer them. Didn't want your comment just lying around unanswered. Ah thank you - I figured this out myself afterwards actually, my attempt is in my gallery! Thanks! thats awesome, love it.!!!! how did you do it???? Aside from the teeth and eyes (which were cut out), the rest was pumpkin flesh, skinned and carved with a clay loop tool. O M G ! @w@ I WANT IT!!!! HOW ON GOD'S GREEN EARTH COULD YOU DO THIS!!!!! IT'S SO FANTASTIC!!!!! Thanks very much! I used a fine pumpkin saw for the cut-out parts, and then just skinned the pumpkin with an Xacto blade for the fur. I used a clay loop tool to give it shading. HOW DO YOU DO THAT!??! 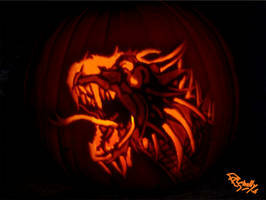 I used a fine pumpkin saw for the cut-out parts, and then just skinned the pumpkin with an Xacto blade for the fur. I used a clay loop tool to give it shading.